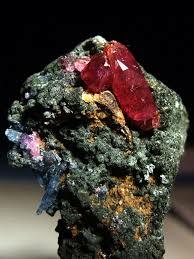 One of the ‘Stone of Kings’, the ruby has long been associated with wealth and royalty, though most notably wealth. Possessing a ruby was considered to be beneficial to the owner’s lands and estates, aiding in the accumulation of wealth, protection of holdings and acquisition of other precious stones. Some other talismanic properties assigned this stone had to do with protection. If worn on the left, (the side of the heart,) this blood colored stone was thought to allow the owner/wearer to live in peace and concord with all men, that neither his land nor rank would be taken from him, and that he would be preserved from all perils. Not only this, but the stone would also guard his house, orchards and vineyards from storms.